As we headed north out of Virginia for Pittsburgh, we really had no idea what to expect out of Big Ben’s football camp. We had never been to any camp like that, but our eleven year old son Jack and eight year old daughter Hannah were very excited to actually see Ben and play on the same field. When we got there, the first thing we noticed as parents was how well the camp was run. Imagine being tasked with making sure 500 kids have a fun, safe adventure for 3 ½ hours on two different days in the summer heat of June! They pulled it off in spades. From the combine-style drills and 7 on 7 games, to the awards and guest appearances of other Steelers like Coach Tomlin, Brett Keisel, Trai Essex, Willie Colon, and Emmanuel Sanders, they kept things moving along. “Ben was obviously having a great time with the kids. He was running around cheering them on and jumping into games. 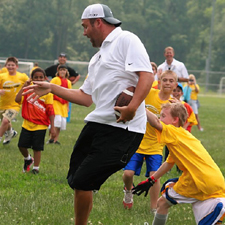 The amazing thing was that he threw a pass to every single kid at the camp – nearly 500 passes. I was thinking that if he throws an average of 30 passes in each regular season game, that would be about 480 passes for the season. He threw more than that in a half hour at the camp. Our kids caught both of their passes from Ben and by the end of the two days they were tired but very happy we came. “Finally, about an hour after everybody else had left the field and gone home, Ben came out of one of the field offices. He had been interviewing with a television crew. I am sure he was exhausted and his arm had to be killing him, but he graciously came over and signed a couple of footballs for the kids and posed for a picture. It was the last of over 500 pictures we took at the camp, but we think it was the best. “My nine year old son Ulrich was one of the children that received the scholarship to the football camp this past week. Ulrich is part of the Big Brother and Big Sister program. Your camp was wonderful and very organized. Ulrich had a blast going there. He loved Head Coach Lynn and getting to meet Mr. Roethlisberger and all the players. He was very excited to meet Mr. Charlie Batch. 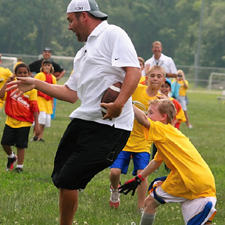 He even tried to tackle Mr. Keisel. Needless to say Mr. Keisel didn’t feel a thing. 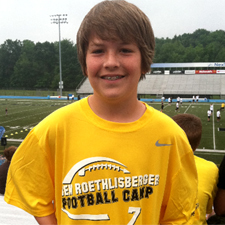 “The Ben Roethlisberger Football Camp was a great success! It was wonderful! The kids all had a great time. My grandsons loved it and can’t wait to go back! Ben was wonderful with the kids…such an encouraging person! I had to laugh at one point when Ben was playing with some of the younger campers during a 7 on 7 game. All the kids were yelling “Ben, Ben, Ben” wanting him to throw them the ball. They reminded me of little baby birds all trying to get the mother bird to feed them! What a hoot! “What a great surprise, also, to have so many Steelers come to the camp during both days! We had Emmanuel Sanders, Trai Essex, Willie Colon, Charlie Batch, Mike Tomlin, Tyler Grisham and Brett Keisel! They all joined in either speaking to the kids or participating in the drill sessions and 7 on 7 games. I can’t believe camp time has come and gone but the kids have great memories now! “Thanks Big Ben for showing the kids at your camp such a great time. My son had a great time and was lucky enough to get to play ball with you. A memory he wont ever forget. “500 passes? I still cant believe you threw a pass to EVERY child. Amazing! We will be posting videos of both days of Ben’s Camp which will include highlights, behind-the-scenes footage, outtakes and bloopers!